The biggest field in Limit Omaha Hi-Low history finished early this morning with victory for the overnight chip leader Francesco Barbaro, defeating a field of 925 players to claim his first ever WSOP bracelet. Barbaro began today as the chip leader just ahead of Matthew Waxman and although he was to relinquish the chip lead to Waxman as they reached the final table, Barbero regained the momentum at a crucial point with around five left and completely dominated once we got four handed. The day began extremely quickly as we lost 11 players inside the first hour including Team PokerStars Pro Lex Veldhuis and double Omaha bracelet winner Scott Clements. 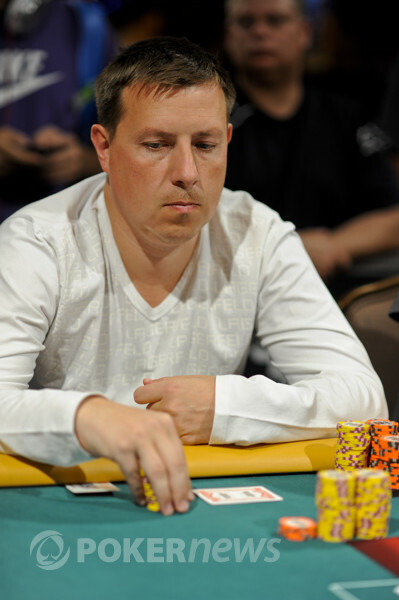 Jimmy Fricke was another casualty, suffering a very swingy day while Day 1 chip leader Guillaume Rivet just failed to make the final table. As the event reached the final table, it was Barbaro, Waxman and Kostas Kalathakis who emerged as the three big stacks while the other players' chips began to dwindle and indeed they were the last three left standing. After winning these two crucial hands, it always looked likely that Barbero would be the first person to take down a non Hold'em event. 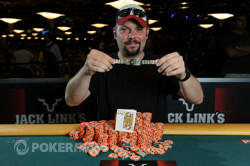 Those hands put him over the 3 million mark and knocked Kostas Kalathakis and Waxman down to about 500,000 each and from then on it seemed academic that Barbaro would claim the bracelet. With Waxman finished off when Barbaro flopped a straight, it was left to Kalathakis to try and stop the bulldozer-like momentum of the chip leader. Although the short stack doubled up, it wasn't too last long and after only five minutes of heads up play, it was all over and bracelet was Barbaro's. Congratualtions to him and all the winners in this event. Remember to rejoin us tomorrow for a whole new set of events as well as more Day 2's and final tables as the WSOP continues! 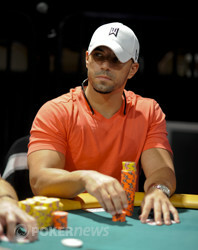 Francesco Barbaro entered heads up play with a commanding 4,100,000 to 150,000 lead over Kostas Kalathakis. In the second hand, Kalathakis raised and Barbaro reraised him all in. Kalathakis called and showed . Barbaro held and would have a chance to finish Kalathakis off. However the board ran out to give Kalathakis two pair and the much needed double up. Shortly after Kalathakis was all in preflop and at risk again. He held while Barbaro had . The board rolled out which gave Barbaro the better two pair and the win. Francesco Barbaro opened to 100,000 on the button and Matt Waxman made it 150,000 in the big blind. Call. The flop came down and Waxman bet 50,000 before Barbaro raised, Waxman made the call. The turn saw Waxman check-call a bet of 100,000 to see the river. Waxman checked once more and Barbaro put out 100,000 to cover Waxman's remaining chips. "One in a bazillion?" sighed Waxman. Finally he called only for Barbaro to turn over for the nut straight. Waxman's hand of went into the muck and Barbaro goes into heads up with a huge chip lead. Francesco Barbaro raised on the button and Kostas Kalathakis called from the small blind. On the flop, Kalathakis checked and Barbaro bet. Kalathakis came back with a raise which was just called by Barbaro. Kalathakis led the turn and Barbaro called again. Both players checked the on the river and showed their cards. Kalathakis produced while Barbaro showed which was good for three quarters of the pot. Shortly after, Barbaro raised on the button and Matthew Waxman called from the big. Waxman led out on the flop and Barbaro answered with a raise. Waxman just called and led out again when the hit the turn. Barbaro reraised him and Waxman just called as they saw the on the river. Waxman check called Barbaro’s bet and Barbaro revealed for the nut straight to scoop the pot. Kostas Kalathakis raised preflop with Francesco Barbaro calling in the big blind to see a flop. 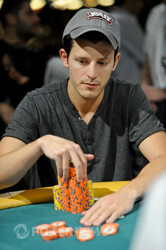 Barbaro called a 50,000 chip bet on the flop, but folded to a 100,000 bet on the turn. Next round saw Kalathakis raise again and Barbaro again defended to see an flop where Barbaro check-called a 50,000 bet. This time both players checked the turn and Barbaro bet 100,000 on the river with Kalathakis quickly folding. The stacks are fairly deep here. Although there is a rule in place this year stating that no event can play more than 10 levels in a night, all three players have agreed to play it out until a winner is crowned. We shall keep you posted on whatever happens. Matthew Waxman raised on the button and Francesco Barbaro called from the small blind. Barbaro check called Waxman’s bet on the flop. The action was the same on the turn. When the hit the river, Barbaro led out this time and got raised by Waxman. He elected to just call and the players showed their cards. It was for Waxman who had a flush and the second nut-low. But Barbaro earned half the pot with his for the nut low. The two players also chopped the next pot for good measure.